Melissa Monroe and Eric Spoerl race towards the finish line during the Rescue Race at the 94th Maverick Club Rodeo in historical Cimarron, New Mexico. Sunset over California wind farm on the Pacific Crest Trail; 2018. Manzana wind farm, Twin Lakes, California, Pacific Crest Trail. Mount Whitney sunrise summit, Inyo, California, Pacific Crest Trail; 2018. “Shocks” hikes up Mount Whitney for the sunrise along the Pacific Crest Trail. Mountain man Carter Smith surveys his surrounding area in a dense grove of aspen trees. David O’Neill, Associate Director of Camping at Philmont Scout Ranch, leads a group of Camp Directors in a flag retirement ceremony. Adam looks out over Palisade Basin from Thunderbolt Pass in Bishop, California. Head of Dean fire lookout, Philmont Scout Ranch, Cimarron, New Mexico; 2017. A scout enjoys the sunset from Head of Dean’s fire lookout. Head of Dean foggy trail, Philmont Scout Ranch, Cimarron, New Mexico; 2017. 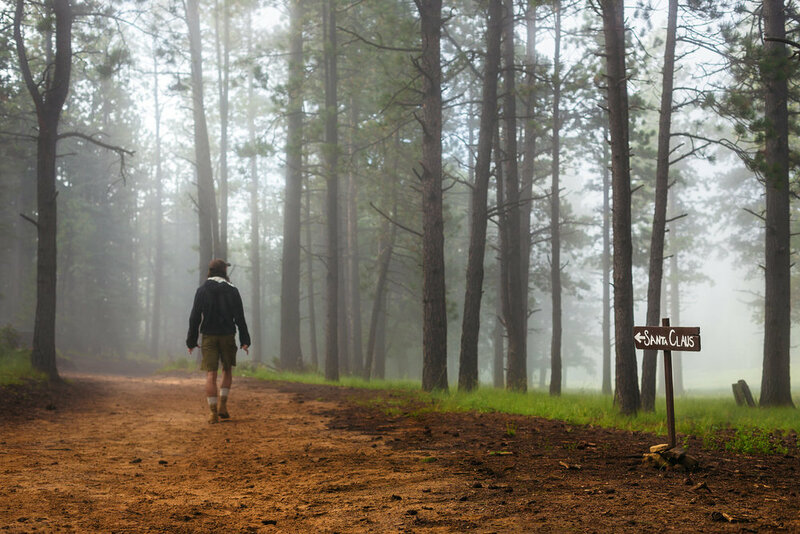 Jackson Graydon walks down Head of Dean’s meadow on a foggy afternoon at Philmont Scout Ranch. Mount Tallac sunset, Tahoe, California, Pacific Crest Trail; 2018. “Trash Bath” takes photos on top of Mount Tallac, Tahoe, California. Kite-flying on the summit of Mount Whitney, Inyo, California; 2018. “Cloudripper” celebrates his sunrise summit of Mount Whitney and flies his kite to celebrate. Hiking in southern California, Whitewater Preserve, Pacific Crest Trail; 2018. Ryan walks through some desert section near Whitewater Preserve, California.